Promises Too Often Made - Too Seldom Delivered. 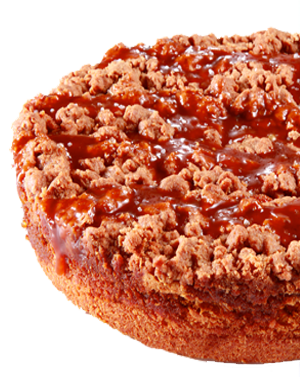 As one of the finest culinary delights in the world, Crumbzz Cakes and Minizz Snack Cakes are crafted from our 400 year old family crumb cake recipe, using the finest natural ingredients in the world. Bourbon Vanilla from Madagascar, ultra fine cinnamon from Vietnam, dark Muscovado brown sugar from the Mauritius Islands, European low gluten flour and dark origine chocolates from Tanzania, are just a few of the specialty ingredients that make our crumb cakes so special. Locally produced, free range eggs and premium unsalted butter from naturally grazing Guernsey cows, lead the list of ingredients we use to support local, sustainable farmers. With all this comes our guarantee that you will never find any artificial ingredients, preservatives or chemical additives in any of our offerings. 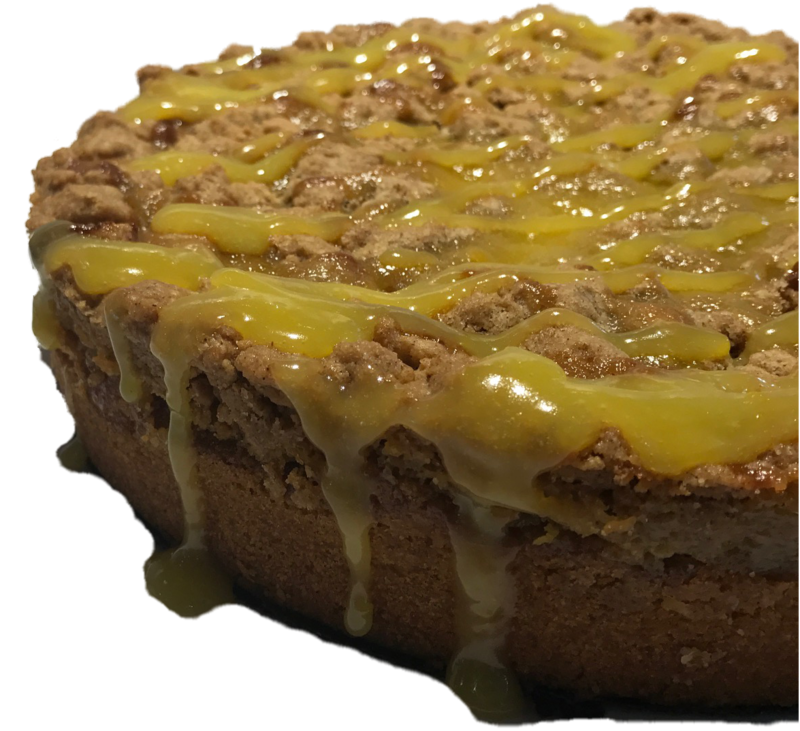 Our artisan made-to-order crumb cakes are ideal for parties, gifts or any time you feel the need for something decadent. 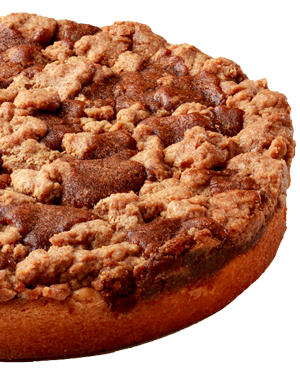 Available in Cinnamon Streusel Crumb Cake, Caramel Sea Salt Crumb Cake, Chocolate Crumb Cake and natural fruit flavor crumb cake, each 10 inch round offering is beautifully packaged to complement the treasure within. 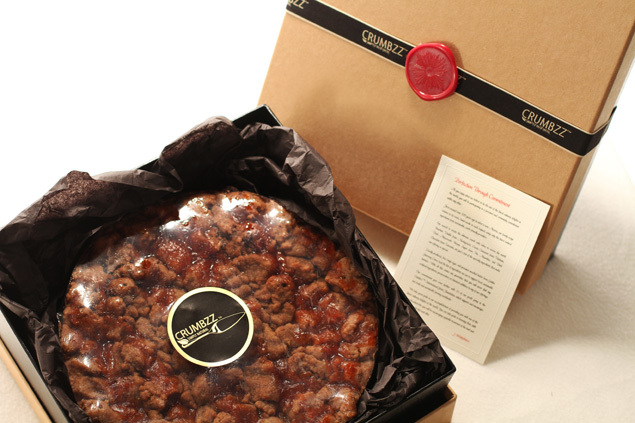 A Crumbzz cake is a great choice for a unique Corporate gourmet gift! Crafted natural colored lids; black belted leather finished bottoms, wrapped in imported Jacquard ribbons and finished with old-world wax seals, assures each Crumbzz Crumb Cake is a beauty to behold. 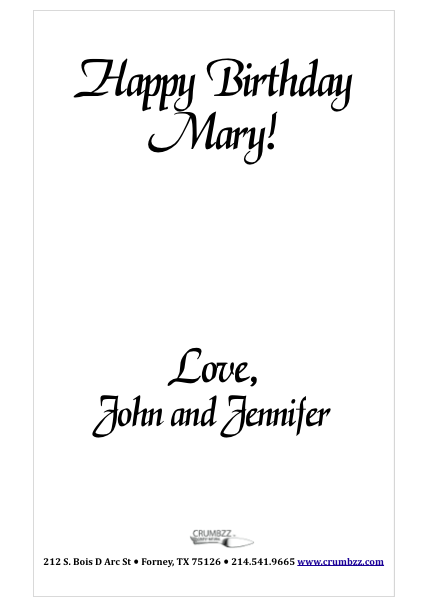 Personalized chef cards, individually signed by the creating chef, accompany each cake. Gifted artisan cakes receive gold plated gift cards with your personalized messages (two areas: top, your message; and bottom, generally who the gift is from) to provide the ultimate finishing touch. 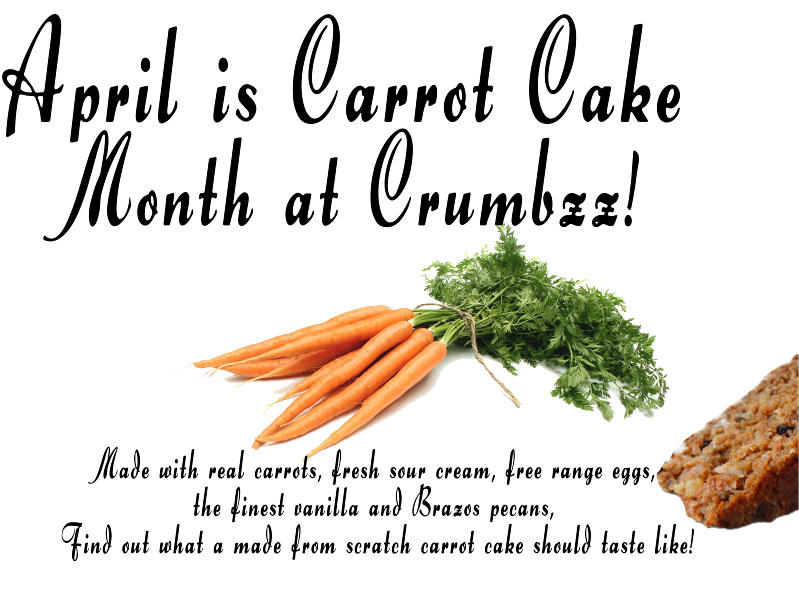 Simply put, Crumbzz Crumb Cakes provide the unmatched combination of dining decadence and exquisite presentation. Another great gift option is the Minizz Snack Cake Trio, wonderful small crumb cakes, beautifully packaged to compliment the treasures within. 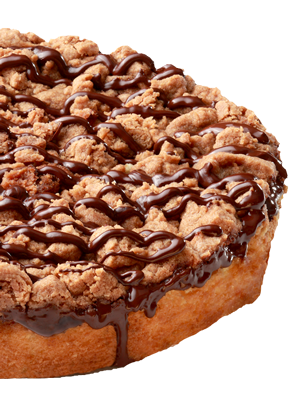 Opening and enjoying a Crumbzz Crumb Cake is a social event best shared with others. There is no better way to show your appreciation than by providing a special gift that will be remembered forever. 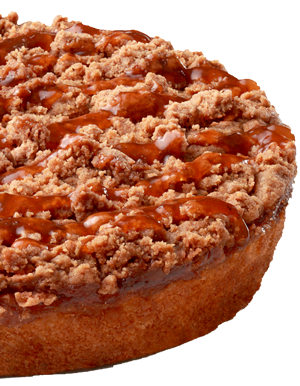 You can select and send a Crumbzz Crumb Cake by specifying a gift note and shipping address in your order, or you can purchase a Crumbzz Gift Certificate for them to use themselves. Simply add the Gift Certificate to the shopping cart, select a denomination and we'll take care of the rest. Picking up your cake or purchasing a gift card? Pick ups at our Forney, TX location and gift card (only) shipments to the contiguous U.S., are free of shipping. If you are picking up your cake at our Forney, TX location or shipping a gift card (only), to assure you are not billed a shipping charge, please enter "pickup" in the coupon section. 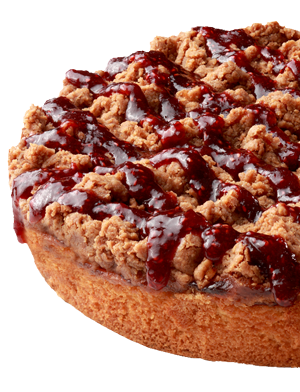 Bring the taste of springtime right into your home with a delectable slice of our Ruby Red Raspberry Crumbzz Cake. Born from the fields of local farmers, our Ruby Red Raspberry Crumbzz Cake springs with the fruity taste of fresh picked, garden ripened fruits. Blended into our moist golden yellow cake and topped off with our Old World Classic Crumbzz topping, this is a true fruit lover's favorite.